More full beards are ruined by bad neck lines than just about any other beard-growing error. Don’t let your full beard be the victim of a bad neck line. 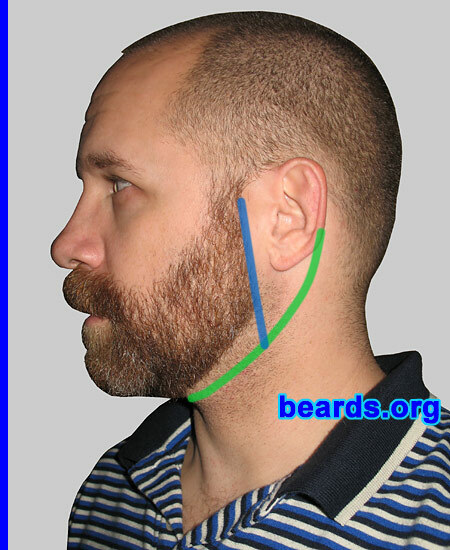 Learn how to define a neck line that makes your beard look its best. Be sure to choose the right cheek line for your full beard, too. create a neck line that defines the beard in a smooth shape that is pleasing to the eye. Why bother with defining a neck line? the beard an unflattering appearance. Unfortunately, the error seems to propagate when new beard growers see someone with a too-high neck line and they emulate it, thinking that this must be the way it should be done. Don’t! Do it right! Scroll down and read on. Individuals vary and these guidelines may have to be adapted to your individual situation. For example, if the boundary between your neck and chin is rather undefined, choose an appropriate point between the two. Just be sure not to set the point too high. proper neckline and will show a different suggested neck line. Step 1: Visualize a line from ear to ear. Visualize a line that gently curves from the back of one ear, down to the top of the neck below the jaw, and back up to the back of the opposite ear. Step 2: Visualize a line extending down from the back of the sideburns. Extend the line formed by the back edge of the sideburns down to where it intersects with the ear-to-ear line from step 1. Step 3: Round off the intersection. Round off the intersection of the lines from steps 1 and 2. In rounding off the intersection, you may choose to extend the rounding back below the ear a bit. Round the intersection off to achieve a smooth shape that pleases you. The steps above result in creating the suggested neck line illustrated here in green. Trim your beard to match the shape of the newly-defined neck line. You may adjust these steps to suit your own preferences, perhaps creating a more angular line or a lower neck line. The main point is to create a smooth, pleasing shape and avoid the mistake of defining the neck line too high. Repairing a neck line or cheek line for your full beard. Also see: Choosing a cheek line for your full beard.